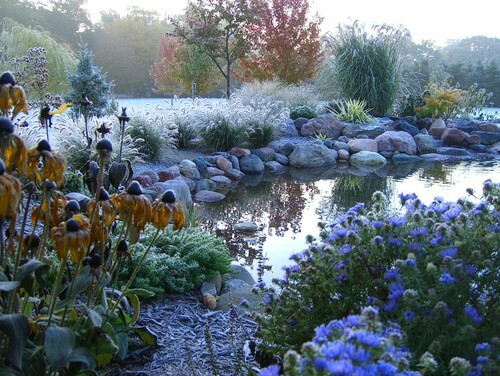 With its range of colors and varied textures, this Wisconsin garden delights in all seasons. 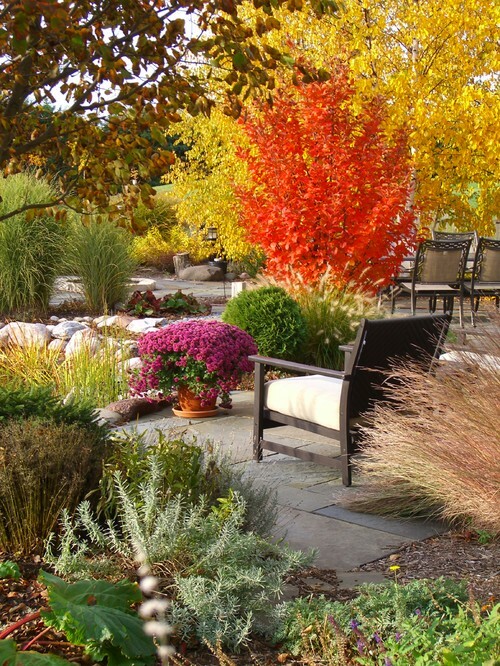 Landscape designer Michael Patek made sure the landscape would provide year-round interest through blooms, grasses, silhouettes and bark. He also provided privacy from the neighbors, made the most of vistas and added a lovely pond. Let’s take a stroll through the seasons in the garden. The color starts to pop out in the spring, thanks to tulips and daffodils all around the house. 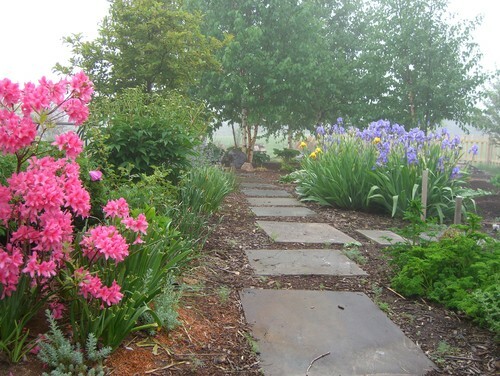 In late spring and early summer, azaleas and German irises on the right side of the house beckon visitors down this bluestone path to the backyard. A garden with herbs and vegetables is just out of the picture to the right. “At this time of year, the peonies were about to pop,” Patek says. You can make them out on the left side of the photo. A group of paper birch trees at the end of the path pushes you to turn left and see the pond. The paper birches have gorgeous white bark and provide shade for a hosta garden underneath. They also offer privacy from the neighboring house. Just in front of the birch trees is an alfresco dining spot and, beyond that, a fire pit. In the background, you can see a silo from the original farm — the farmer sold some of his land for this development of homes on 1.4-acre lots. 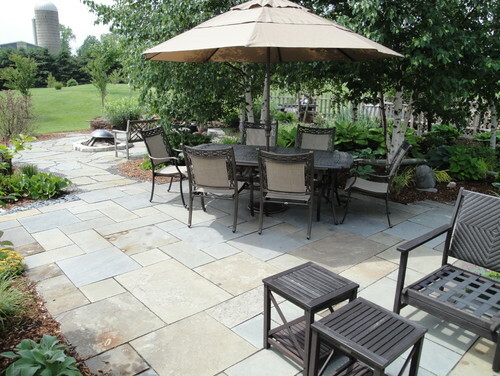 The patio is full-range bluestone in a pattern composed of five sizes. “It has a full range of color — coppers, grays and blues,” Patek says. The bluestone’s hues complement the ever-changing colors in the plant palette. 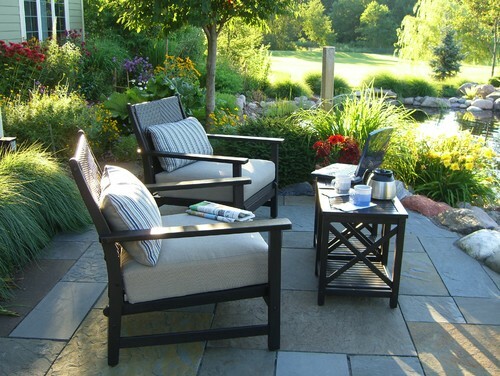 Turning left at the birches leads you to this backyard patio, seen here at sunrise during midsummer. Around the patio, you’ll spy silvery-green ornamental grass and yellow ‘Happy Returns’ daylilies. A ‘Pumila’ spruce provides evergreen color year-round. The pond is about 3 feet deep. It has a rubber liner with a gravel bed on the bottom and two waterfalls. 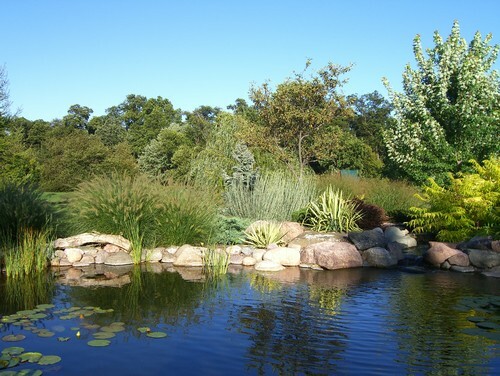 Patek used a pond system by Aquascape and highly recommends it for its durability. The boulders around the pond’s edge are local Wisconsin granite. “Granite is preferable to limestone around the pond because it has less of a leeching effect on the water,” he says. From left to right you’ll spy ‘Grey Owl’ juniper, mugo pine, barberry, little bluestem and Tiger Eyes staghorn sumac. In the pond are waterlilies and water irises. In the fall, all eyes go to the brilliant orange-red leaves on the Japanese stewartia tree, its white summertime flowers just a fading memory. The leaves of the paper birch trees provide a beautiful golden yellow backdrop. On the ground, the grasses transform to wheat colors, the lavender maintains its somewhat spiky structure, and the yellow coreopsis blossoms are going to seed. 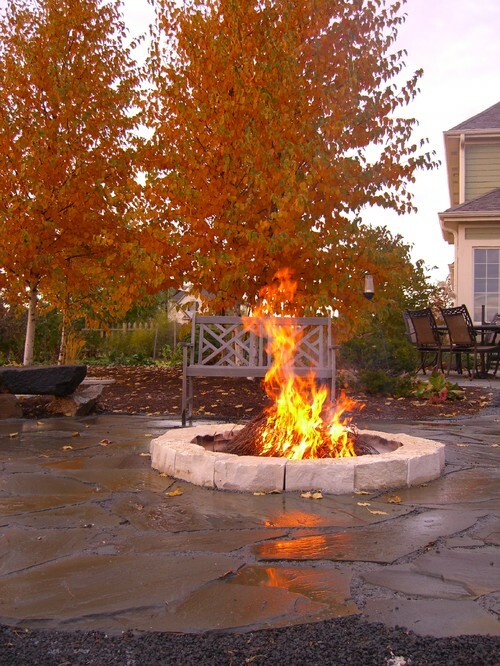 Fall is a wonderful time of year to enjoy the fire pit, which is 4 feet in diameter. There is a metal ring inside concealed by limestone. This part of the patio is also made up of the full-range bluestone, but this time, the stone is cut in an irregular pattern. “It’s a little more natural and less formal,” Patek says. Erigeron’s purplish blues look beautiful during a fall frost. During winter, colors and variations in bark as well as interesting silhouettes provide interest in the foreground. The snow-covered meadow leading up to the edge of the evergreens in the woods is a serene winter vista. 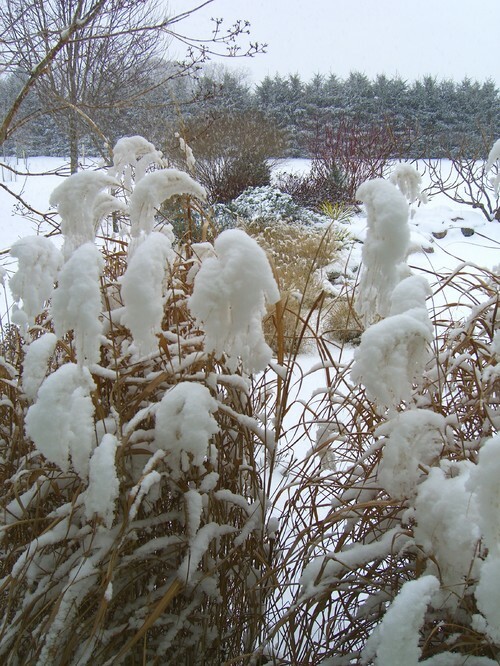 Patek says the opportunity to enjoy the snow atop the purple miscanthus like this is short-lived. “If it snows just right, it looks great, but if the snow is too heavy, it just pounds it into the ground,” he says. Toward the back of the photo, the branches of the redtwig dogwood will contrast with the snow until winter ends.